First, choose correctly from the 3 different sizes of tub to shower kits. Doing so will ensure the best fit for your tub. It is very important you determine the correct tub to shower kit size. Therefore, please review the dimensions for the different tub to shower kit sizes available. Then, you can select the correct tub to shower kit size for your tub. Small tub to shower kits are to be used with a maximum rail size of 4-3/4″. The portion of the tub cut out for the small kit is 25″ at the tub rail and tapers to 23″ at the base. The height of the portion removed for the small tub to shower kit is 8″. Click here to order a small tub to shower kit. Top width of the medium kit is 6-1/4″ and bottom width measurement is 7-3/8″. 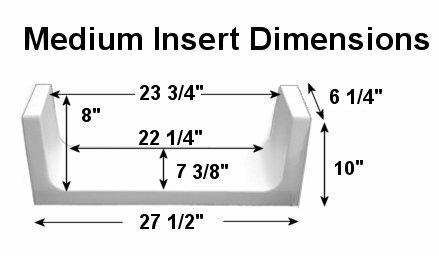 The portion of the tub cut for the medium kit is 25″ at the tub rail and tapers to 23″ at the base. The height of the portion removed for the medium tub to shower kit is 8″. Click here to order a medium tub to shower kit. The large kit is 28-1/4 inches long and 11-3/4″ tall. The top width of the large kit is 8-5/8″ and the bottom width measurement is 9-3/4″. 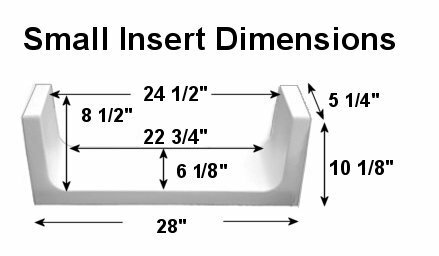 The portion of the tub cut for the large kit is 25-1/2″ at the tub rail and tapers to 23″ at the base. The height of the portion removed for the large tub to shower kit is 10″. Click here to order a large tub to shower kit. If your tub rail is straight without any curve in the design; selecting the correct tub to shower kit is quite easy. 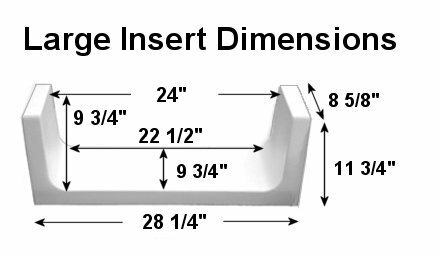 However, if your tub design contains a curve or an offset across the front of the tub, the insert will NOT curve along those lines. Furthermore, you will need to include the curve into your rail measurement to ensure the correct tub to shower kit is ordered. So, be sure to follow our detailed instructions here for selecting the correct to shower kit. Seems like this is a common question when searching for tub to shower kits, yet it isn’t one we can easily answer. First of all, you need to know the height of your individual tub. Then, subtract the cut out dimension height of the correct shower kit for your tub from the total height of your actual tub. Finally, this should give you an approximate finished step height. As an example, your tub skirt measures 12″ from the floor to the rail. You order the medium kit which has cut out height of 8″. Therefore, your finished step over height should be approximately 4″. Yet, if you need the step over height to be lower than 4″, you might consider purchasing the large kit instead. Since the large kit has a cut out height of 10″, your step over height would be closer to 2″. The finished look will not be as pretty. Most likely, you will have more of the insert protruding inside, outside and/or above the tub. As a result, it will allow you to lower the height of the step.